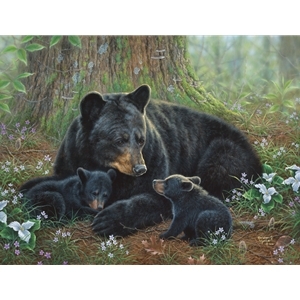 On this beautiful spring morning, a momma black bear is taking loving care of her cubs. She has just lulled one of them to sleep and now the other child needs her attention. Being a mother has to be the hardest job there is. But regardless, you can see the patience, love, and strength in her eyes. She'll help them grow, teach them, protect them, love them, and be their role model. In these Tender Moments of their childhood she gives them memories and love to last a lifetime. During the many hours of painting this piece, I drew inspiration from my memories of my mother while growing up. I was one of five kids, and no doubt we caused her a lot of stress by how crazy we could be at times. Love is patient, love is kind, and that's what we got from mom. This painting is dedicated to her and to all mothers who rarely get the credit they deserve.